So, I was sure I was the 10th, which is why this post is later in the day then I intended. Apologies for that. Now, I’ve already written a very long post about a book that changed by life, Anne of Green Gables, and I doubt you guys want to read more gushing about Anne, lovely as she is. Luckily, there’s another book that changed my life. Currently, it’s in a battered form of blue paperback book, sitting on my book shelf. It’s the first book I properly read that wasn’t a ‘Early Reader’ book. 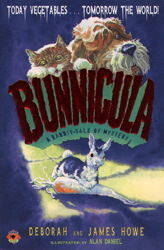 The book in question, is Bunnicula. Golly, I love this book. It makes me laugh so my sides hurt. It’s about a vampire rabbit(he drinks vegetable juice), a slightly crazy(oh, come on, extremely crazy) cat, and a dog that just wants to relax. And then we get a another dog, who’s a werewolf. According to Chester. And it reminds me of Artemis Fowl, for some reason. Maybe the humor? I first read this when I was…seven? Again, I didn’t want to admit I succumbed to reading. I was being taught how to read…and learning was boring. In my opinion. But this really fueled my love for read. So thank you Harold. Please bring your editor another book soon, and have a chocolate cupcake(with cream in the center) from me. January 10th – http://www.nonconformistwriter.blogspot.co.uk – Life. TAG, YOU’RE IT. My blog has the details. And I know Bunnicula! At one point in my first novel, my characters hid away and read it to each other. 🙂 Thank you! Hehe, this should be a fun meme. I’ve never heard of it, but it’s great to have a book that really made you want to read. You know, you go the first few years of life only reading because your parents made you and then bam. Reading is awesome. Exactly. And I was a especially stubborn little kid when it came to reading, learning, etc.